Deuce. Ace. Love. Game. You know the words. And whether you’ve played for years or you’re just beginning; tennis is a wonderful game that merges skill, athleticism and camaraderie. A thrill to watch, it’s even more fun to play. </Press Release/> – Long Island, NY, May 12th, 2007 – Elsa Deutsch-Garcia, one of the top U.S. designers of original wedding rings and engagement rings, announced her intention to broaden her company’s activities to include designing sport related pieces, and to work closely with charities like Cancer Care to strengthen their fundraising efforts. Since 1986, Elsa Jewelry has created more original wedding rings and engagement rings for more private clientele then any other company in the U.S.A. – over 20,000 original pieces – surpassing any other designer or company by far. In 2000, Elsa Jewelry reached the enviable position of being among the top 8% of privately owned, single-unit retailers whose yearly gross exceeded $2,000,000. 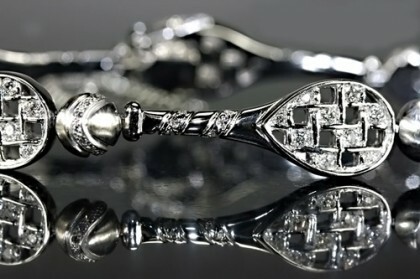 This year Elsarings.com, the online retail site of Elsa Jewelry, announced it’s intention to present an original design, “The Tennis Tennis Bracelet” as a gift to the top ranking female tennis player in the world. Elsa eagerly looks forward to the opportunity to grace the female tennis tournament winner with one of her designs. For beautiful, hand crafted, timeless engagement rings and wedding rings look no further than www.ElsaRings.com. Here you will find a variety of engagement rings, wedding rings, eternity rings, anniversary rings and more. ElsaRings.com is a privately owned company based on Long Island, New York. Appointments are also available with its principle designer; Elsa Deutsch by calling 800.440.3572. It is an ideal resource for anyone shopping for jewelry for either himself, herself or a loved one. All jewelry items are custom made with care and packaged in a beautiful white leather box ready for delivery.